Cereal foods are made of the farinaceous (meaning-floury) seeds of plants belonging to the grass family, and in some instances, doubtless, in part, of the seeds of such leguminous plants as peas and beans. These valuable grain-bearing plants were, probably, among the first to furnish food to the human race. Pliny speaks of wheat, in writing of the ancient Roman people. China has history of the use of cereal grains as early as 2,700 years before the Christian era. And there is evidence that the lake dwellers of prehistoric Switzerland used seeds of millet as food. In America the natives were using corn when white men came to the western world, and the evidence seems complete that the ancient Cliff Dwellers of the Mexican and the southern part of America used corn as food. The American Indians residing in the north used large quantities of wild rice or Indian rice for food. All the cereal grains now largely used, excepting maize, have been in use in the Eastern hemisphere since ancient times. While the culture of the cereal grains had made some progress throughout the preceding centuries, the greatest advance along this line has come within the past century. The machinery for cultivating and transporting cereal grains, and products made from them, has made most wonderful strides during the lives of the present generation. Processes in the manufacture of cereal foods from cereal grains form one of the marvels of modern progress. And the rate of this progress seems to be accelerated as each year's experience is added to the last. It is not long since our ancestors had only the crudest means of grinding grains, and no thought occurred to them of pearling and mixing, and partially cooking and flavoring, and otherwise preparing these foods into the many forms now found on our markets. Our grandmothers were pleased with the simple straight flour from which the coarsest bran had been removed. They took great comfort in the bolted cornmeal and the oatmeal which was used only occasionally by others than the Scotch. These foods, together with rice and hominy, made up the list of cereal preparations. Now we have our wheat flour graded so that we have patent flour for bread, pastry flour for pastry uses, and various brands for special purposes. Instead of the uneven sample of flour furnished to the farmer with toll retained by the old time burr mill in return for his grist of wheat, we now have the uniform patent flour made every day the same by the modern roller mill with its wonderful machinery. We have also not only cornmeal which is better bolted and more uniformly ground, and oatmeal of finer quality, but we have dozens of other more or less popular meals and flours, and cracked and polished grains, which we have come to know as "cereals." America's rich soil, energetic people, favorable climate, and her mechanical and commercial genius have combined in the production of large amounts of cereal foods. The best varieties of these crops have been gleaned from the whole world, and in many instances they have been improved upon. Here, as in manufacturing, progress seems to be making rapid strides, and bids fair to hold a permanent place. Owing to the fact that farmers can so cheaply produce at home a variety of foods, they have not felt the need of rapidly taking up the use of even the better forms of manufactured cereal foods put upon the markets during the last one or two decades. Doubtless their conservatism in this, as in many other things, has kept them from enjoying advantages which are within their easy reach. Most cereal foods are economical in that for a given amount of money a large amount of food material is purchased. They are healthful in that they lessen the tendency to eating too much meat, and they furnish all the elements needed to nourish the body. They have bulk enough to give the digestive organs their needed amount of muscular exercise, yet they rarely cause indigestion. Cereal foods tend to good morals, since, when they form a goodly portion of the daily food, there is no excessive stimulant to the body, nerves, or mind. They are sufficiently bulky so that there is little tendency to overeating, and thus overloading the system with an excess of flesh formers, heat formers, or ash which must be carried out, requiring excessive labor on the part of the excretory organs. These foods are very appetizing, and since many of them are especially relished when eaten with cream, which is nowhere so abundant and inexpensive as on the farm, no class of people should appreciate them more than farmers. Manufacturers rival each other in embellishing wrappers and inventing novel names for their wares. Extravagant claims are made for these foods, and much is said to induce the public to believe that, by some peculiar method of manufacture, an article far superior to simple, plain oatmeal or rolled wheat has been produced. The fact is that there is, in most cases, more variation in price than in food value, and the relation between quality and cost is sometimes difficult to discover. The package goods have one merit, and that is, the manufacturer is made directly responsible to the consumer. The oatmeal sold in bulk is practically uniform in composition, and, unless injured by long keeping and exposure, there is little, if any, discoverable difference in quality and flavor. The package cereals usually make greater claims for quick cooking than can be well substantiated. Granting that, in such cereals, a portion of the starch grains have been crushed and partly converted into more soluble forms by-means of heat, pressure, and moisture, thus lessening the time required for cooking, yet experience proves that they usually have a better flavor when cooked half an hour than when removed from the fire after ten minutes cooking, as the packages sometimes direct. The carbo-hydrates of cereals are mostly in the form of small, hard, starch grains which are not easily attacked by the digestive fluids. Experiments made in feeding cooked cereals to domestic animals seem to verify the statement that little cooking renders them less digestible than when eaten raw, but a long, slow, thorough cooking brings about good results. Cellulose is the woody portion of plants. In such foods as spinach, the cellulose is young, tender, and digestible. In grains, the cellulose is found in its mature state, and can hardly be classed as a food stuff for man, yet it plays an important part in giving bulk to the food, and aids in preventing the tendency to too concentrated food. It acts as a mechanical stimulus to promote the peristalsis of the intestines. Bunge, in his Physiological and Pathological Chemistry, says: "While it is urged that the rapid and continual movement of the intestinal contents in consequence of the irritating action of the woody fibre prevents the complete utilization of the food, at the same time," he continues, "it appears to me that the advantages of food containing cellulose far outweigh the drawbacks." All oily matters in grains are termed "fats." These are similar in composition to carbohydrates, but the fats are poorer in oxygen and richer in carbon and hydrogen; therefore the heat equivalent of fats is much greater,- that is, a pound of fat will produce more animal heat than a pound of starch or sugar. Buckwheat is a good example of a heat-giving cereal. It is more agreeable when used in cold weather, and by those who exercise freely. It is used principally in the form of griddle cakes, though it is sometimes found in the markets in the form of a specially prepared cereal. Cereals contain a small portion of the several mineral matters which are necessary for both bone and flesh, but there is usually no deficiency of most of these in our diet. Phosphorus is considered of much importance, and special efforts are said to be made to secure it in milling. One authority on physiological chemistry says that, with the exception of preparations of corn and oats, all the cereal foods lack the fat necessary to a normal diet. The proteids and carbohydrates occur in the proper proportion in them all. Since human beings select their foods largely on account of flavor, why not supply the fat to the foods in the form of cream. A dish of breakfast food which is eaten under protest when served with milk will be relished when cream is used. It is not extravagant, because the cereal costs only a few cents a pound and the willingness with which it is eaten well repays the cost of the cream, which, on the farm, is not expensive. To compensate for the lack of cream in oatmeal and cornmeal mush, a garnish of fruit can sometimes be used. Strawberries, peaches, raspberries, and bananas, each in its fresh state, are considered best for this purpose, as the flavors are sufficiently pronounced so that the two foods, eaten together, are very appetizing. The manufacture of special cereal foods is taking on a wonderful development. These foods have the well-balanced composition of the cereal grains from which they are made. The staple cereal foods, as wheat flour, corn-meal, and oatmeal are the sources of the cheapest food materials we have. Their large use not only does not endanger health, but also prevents our over-eating of the too rich albuminous foods and sweets. Good bread prevents our eating the less wholesome cakes. Oatmeal for breakfast aids in avoiding the too free use of meats, and cornmeal mush as a part of the evening meal fills our stomachs with nourishing yet light food, and allows us to have sweet dreams. Especially are these cereal foods a blessing to growing children and to adults during periods of lessened activity, as in winter, when less muscular exertion makes a lighter diet well nigh imperative. Flour, oatmeal, and cornmeal are so cheap as compared with most other forms of food that farmers should exercise great care in securing that of good quality. It is likewise important that these foods be cooked in the most perfect manner. Very many people with diseased digestion are constantly distressed, injured, and made far less able to be happy, to perform work of any kind, or to be useful to others, by eating wheaten bread which is improperly made. Bread made by a slow process, with low temperature, or with the dough now warm, then cold, develops within itself not only a yeast fermentation, but other ferments as well. A mere trace of an acid developed by injurious fermentation, an amount barely sufficient for the taste or the smell to detect, will disturb the digestion of many people in health as well as those having weak digestion. The most important matter in connection with oatmeal is to have it made of sweet and well-flavored grain. It should always be fresh and well cooked. Under such circumstances, it will be palatable, and may be used often and is always relished. Cornmeal should be nicely prepared, and should be properly made into mush, that it may be enjoyed for supper; and a remaining portion fried for breakfast is very acceptable. The fact that farmers have fine milk and cream at first cost is a most favorable circumstance to their using large quantities of cornmeal and oatmeal mush. These foods are often more delicious, and probably more healthful, than many of the modern compounds which require much more labor in their preparation. They are also very inexpensive, as will be shown further on in these articles. In order to have good health, people must have food that supplies the quantities of nutrients which the body requires. Yet this is not all that is necessary. The food must be such that the person can digest it, else it does him harm, rather than good. Experiments in the digestibility of foods lead to the belief that fat as found in pork is difficult of digestion; and when taken in large quantities, a considerable portion of it fails to be utilized in the system, and thus entails unnecessary work on the different organs to remove it, with no benefit to the body. It would be well, then, to replace a part of the meat with some food which will furnish the necessary ingredients in a more digestible form. The cereals, when properly cooked, are very completely digested and assimilated. The quantity of protein in cornmeal is small as compared with some other food stuffs, but it is a valuable nutrient because easily digested. The fat of butter and cream is more digestible than that of bacon, owing in part, probably, to the more delicate structure of the cell walls in which the fat globules are inclosed, or the absence of such walls. A glance at the preceding table, compiled by Prof. W. O. Atwater, will show that oatmeal has rather more protein than wheat flour. In comparing wheat bread with wheat flour, we find that the chief difference is that the bread has a larger proportion of water, and a greater amount of fat, owing to the water and milk used in its preparation. As we run down the scale, we find that the cereals prepared from barley rank next to wheat flour in the amount of protein contained. Cornmeal contains more protein than buckwheat flour, and rice ranks lowest in proteid matter. There are many cereals prepared from oats, but coarse oatmeal, fine oatmeal, and rolled oats usually give a satisfactory variety in this cereal. These can all be bought in bulk for two or three cents per pound. They are all cooked in the same manner; the only difference in the process being that the coarser ones require a longer time and a greater proportion of water. The protein in cereals is in the form of gluten, and is very hard when dry, and needs long cooking. Starch, in a raw or half-cooked state, is neither very palatable nor digestible. Each starch cell is surrounded by a thin wall of cellulose, and this must be softened by the heat and moisture, so that the starch cells may absorb water, distend, and become soft and digestible. Coarse oatmeal requires a very long, slow cooking to thoroughly prepare it for the action of the digestive fluids. It is well to have this for breakfast on the morning following baking or ironing day, as the fire necessary for the extra work can be utilized in partially cooking the cereal for the next morning's breakfast. Among "cereals" prepared from corn, the good old hominy, a dish borrowed from the Indians, awakens pleasant memories in the minds of those whose youthful palates were tickled by this delicious and wholesome article of food. The coarse hominy of early days, in America, was made by soaking the grains of corn in weak lye made from wood ashes, until the outside covering became loose. The grain was then taken from the liquid and washed in two or three clean waters, and the hulls rubbed off by the hands. It was then soaked in clear water to remove all trace of the lye. When ready, it was boiled in slightly salted water for some hours, until it became perfectly tender. By placing it out in the pure cold air, and allowing it to freeze, the hominy was thought to be improved, as it was more tender, and slightly changed in taste. It was eaten with milk or sauted in butter or meat drippings. This method of preparing it was very simple. A spider containing a generous supply of whatever fat was to be used for cooking the hominy was placed upon the stove and allowed to become hot. Then the hominy, free from water, was put in and stirred about and seasoned to taste with salt and pepper, and, when thoroughly heated, was served in a hot dish. 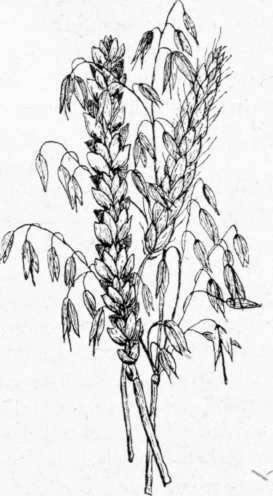 In some localities of the far west, wheat and barley were hulled by some home-made device, and used as cereals. Cornmeal mush with cool whole milk often makes a satisfying supper on a winter evening, and such a repast usually leaves no ill effects. In addition to the whole-grained hominy, coarse hominy, fine hominy, and other cereals are common in our markets. These can be purchased in retail quantities at two to four cents per pound. Coarse hominy, like coarse oatmeal, requires a very long time for cooking.